Nowadays, replacing a lost or stolen Smartphone is not a big deal, but if you have not been properly backing up your photo collection, a lost phone can very well end up in robbing you from those magic moments of your life collected over a period of time. However, the good thing is that Android platform offers you various convenient ways of backing up your photo collection automatically. Whether you prefer local hard drive for storing them or want them saved on cloud, we are here with a few great methods to make sure that the contents of your camera roll remain safe and sound, easily recoverable for you whenever you need them. Below, you can read detailed Review of Top Three Best Photo Backup and Online Cloud Storage Free Applications for Android Smartphones and Tablets. Social Networks not only offer you multiple ways of staying in touch with your loved ones, but various other beneficial features as well, and saving your photos is one of them. In addition to automatically backing up unlimited photos online (whether you prefer sharing them or not), Google+ also enables you fine-tune with various interesting effects like red-eye reduction, color balance, creating animated gifs and so much more. And to avail all such amazing features, all you need is to install the Google+ app on your smartphone. In fact, you receive a prompt for setting up auto-backups when you run the setup for the first time. Moreover, these features can also be turned on manually by following: Settings > Auto Backup. Dropbox, one of the most popular contemporary cloud storage services, also enables you to upload photos and videos on your Android phone automatically as you take them, which remain stored and accessible online. You can view them and download them on your will using Dropbox’s apps, website or the Dropbox desktop app to move your desired photos either on local storage or even an external hard drive. On launching the app for the first time on your Android device, you will receive a prompt for setting up the photo backup for all your camera contents. Though there are some really wonderful perks of cloud storage, but when it comes to reliable access and cost effectiveness, cloud storage is no match to local storage. If you prefer keeping copies of photos loaded on your smartphone safely on a laptop, desktop or a network hard drive, BitTorrent Sync is the way to go with unmatched ease and convenience. In order to set the BitTorrent app on your Android device, download it and proceed to the “Backup” section. Then you have to locate photo directory of your phone after tapping on the folder icon. (It usually resides in something like “Camera” or “DCIM”.) After that you have to email yourself the secret code provided during the proceeding. Next step pertains installing the desktop software and selecting the option “Add a Sync Folder” under the tab “Folders”. Once done, go ahead by entering the secret key in the very first line, followed by hitting the “Browse” in second line. This will enable you to select a location where you want your photos to be stored. 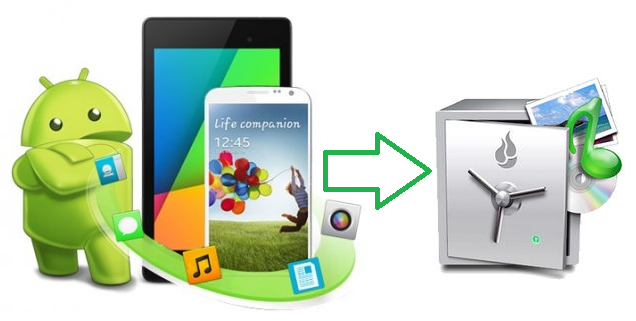 BitTorrent Sync will automatically take a backup for them whenever you are logged on through the same Wi-Fi network. With these 3 Reliable and Convenient Ways for Backing Up Photos on Your Android Device handy, you don’t have to be worry about how to retrieve golden moments of your life anymore. So, go ahead and see which way suits you the most for backing up your Android photos.